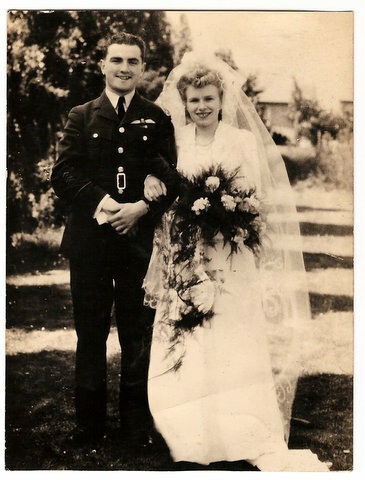 This Sunday, I am remembering my great uncle, my mother's young uncle: Flying Officer Peter Blackham,who died in France at the age of 21 on the 8th of July 1944, husband for just three weeks. He was the pilot of the plane (a Lancaster bomber) that was shot down that night near Ecquevilly, just a few kilometres west of Paris. Aboard were four Canadian airmen and three British airmen. Only one of them survived, Sergeant Murrie who was saved by the villagers who hid him quickly. He is standing in front of the graves in the picture below during a memorial service in 1995. It was quite unusual for airmen or soldiers to be buried in a French cemetery and not in a war cemetery, but local people took the poor airmen to heart, buried them in their cemetery and have cared for their graves ever since. We had a hard time finding my great uncle's grave before internet came into fashion, but with a few exchanges of letters, we managed to eventually make my mother's wish to visit her uncle's last resting place and lay flowers at all of the graves. It was with contentment that she wrote a thank you letter to the local mayor for keeping the graves so well tended. My great grandmother stood in that very spot as she was taken there after the war, but the address was lost. ... remembering and thinking of, all those who have served and are serving now. Thank you for you kind and healing thoughts, they have been working on me! Thank you for remembering the brave who have served. My Grandson, Emery, 19 yrs., is on the Pakistan and Afghanistan border serving now. As we approach, Veterans Day here in America, I can hardly get my head around him being a veteran where he returns, so young. We all should remember the soldiers, men and women, past and present for what they do for their countries and families. Thank you for sharing about you great uncle, we will remember him this Sunday. Thank you for sharing your story, my heart goes out to you and your family with what you must be feeling every day thinking of your brave Grandson. May God keep him safe. Seeing these young men in their uniforms gives me goosebumps. As does seeing our veterans in theirs now. My father in law will be placing a wreath this Sunday at the Cenotaph. He was in England and France and made it safely home to Canada. Your great uncle made a sacrifice that we are proud of and thankful for. So sad he was so young. God Bless him. I do hope you will feel better soon. Thank you, it is so good to hear other peoples stories, especially for us the ones who got home. My mother was really pleased to have just shared a small bit of our history that means a lot to her, it made her happy to see people write something. You must be so proud of your father in law. Thank you, you must be so proud of your parents and yes, it was so different. We have so much to thank them for. God bless them all who died and served, and still serve so that we can be free. Proud Mother of a Royal Marine, daughter of a former Merchant Navy officer and granddaughter of WWII Marine Engineer. So well put, thank you for writing. You really have a lot to be proud about, we have so much to thank for brave families like yours. My thoughts go out to keeping your son safe. Dear Ivan, I'm sorry you aren't feeling well. I hope you are up and about very soon! This post touched my heart - deeply. I don't think I've ever corresponded with anyone from Europe about WWII, who lost family. My dad's family sent 3 of 4 sons into WWII, my dad was too young to serve. We also were also blessed to have them all return to us, marry, build families and live long lives. My grandfather (my father's dad) was himself a veteran of The Great War (WWI). I have recently learned through family folklore, that when his sons joined up, he lost all his hair overnight and remained bald. That's how I remember him, and I used to call him "Baldy Murphy" LOL!!! How wonderful that you were able to locate your great uncle's final resting place and what peace your mom must have felt, finding and visiting her young uncle's grave. What a beautiful looking couple they were. These men and women truly were the greatest generation. Thank you, I read your post which was also very touching. As I said above it made my mother so happy to know that he wasn't forgotten. I wanted to go to the grave this weekend but wasn't well enough, so I will go and place some flowers for them all at Christmas. Thank you so much, there were so many of them and so young. Ivan, I'm so sorry you aren't feeling well. I hope you feel better soon. Husband for just 3 weeks - how heartbreaking. My father was a WWII veteran. He passed away on Veteran's Day years ago, so the day is a day of reflection for me. I am so sorry to hear that, it must be a very difficult day for you. You must be so proud of him. Thinking of you get well soon. Je suis désolée, j'espère que vous avez un prompt rétablissement. Amicalement. Merci, Je me repose... j'espère que vous allez bien! Ivan, I hope you feel better soon, and I hope you'll eat well and take it easy for the time being. I am going to make your chickpea-lime soup for lunch today, so we'll be thinking of you. I plan to make your blackberry yogurt cake soon except with blueberries, because that's what I've got in the freezer. Thank you, I have been taking it easy. Hope you liked the soup? The cake will be fine with blueberries, I am planning the same thing! Ivan, what a beautifully moving post. Thank you for sharing the story of your great uncle. I found it especially moving as I have just posted about my grandfather, a RAF navigator whose plane was shot down into the Bay of Biscay. He survived and spent the remainder of the war in a POW camp in Poland. He died five years ago and would be 90 if he were alive today. He would have been close in age to your great uncle when he fought. Your photo is just heartbreaking, to die so young, so handsome. Thank you for stopping by. It is such a sad subject but talking about it is so important. It must have been quite touching for you to speak to the veterans making plans for such a difficult but necessary trip. I know my mum was just happy for me to tell his story, so he could be thought about, once more. Thank you again. I just finished reading a book today and I will try to do a post about it but it was so moving, such an incredibly heroic story that I will have to wait a while before I can. The book is "The Forgotten Highlander" and is by a man from Scotland who survived being a prisoner in Japan during World War II. You know those men who I talked to as a travel agent? They all said that they were not heroes, but that the men who died were the ones who were the heroes. Sorry, for typing so much here, but I feel that so many of these men died and hardly anyone knows of their sacrifice. Thank you for writing and joining my blog. Oh, may I just mention one other post that I did about a World War II veteran? I did a post about Louis Zamperini in January of 2011 if you would like to read it...he wrote a book, "Devil At My Heels". I loved it so much, I sent a letter to the editor and I received a HANDWRITTEN note from Mr. Zamperini himself! There is another best-seller about him entitled "Unbroken" by Laura Hillenbrand. Tell your Dad about these! The men who survive war have so much to go through afterwards. It is a real problem in this country for those returning from the wars in Iraq and Afghanistan right now. And I have not been to Normandy, but would very much like to see it. Thank you so much, I have passed that on. What a lovely thing to get back from the author! I hope you get to see Normandy one day! Best wishes and I shall go and read your post.